Veteran artists like Barbara Bourget, Lola MacLaughlin, Jennifer Mascall, Jay Hirabayashi and current artistic director Peter Bingham were all founding members. Much of the cream of the next generation are, or have been, principal dancers with EDAM—performers like Anne Cooper, Delia Brett, Kate McDonough and Susan Elliot. Companies as diverse as Anatomica, The Holy Body Tattoo and MACHiNENOiSY can trace roots back to this small but critical institution. To a large extent, EDAM has been defined by the practice of contact-improvisation. 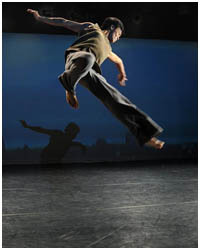 ‘Contact’ is a dance partnering ‘technique’ that uses the floor as an extension of the body’s skeletal support structure. Dancers develop an intimate relationship with the ground beneath them, they learn how to soften into it, how to dialogue with it through their muscles, tissues, and nervous system. With this as their base, they develop complex, in-the-moment weight shifting arrangements with other dancers. It’s about having a 360-degree, inside-outside awareness. Where traditional dance forms like ballet and Graham-technique strive for the creation of external images through an emphasis on muscular control, contact-improvisation is concerned with the flow of psychokinetic relationships forged and re-forged in the moment. In recent years EDAM has also become a place where choreographers from other dance disciplines come to investigate, experiment, and reveal sides of themselves you didn’t know they had —from modern ballet to butoh, and most points in between. Which brings us to the title of EDAM’s current offering: The Body Eclectic. This evening of four short works starts with a spacious retelling of a Japanese Buddhist legend by Mandala Arts choreographer Jai Govinda, and ends with an emotionally dense diptych by ballet veteran Emily Molnar. At the center of the evening is a new piece by EDAM’s Peter Bingham. While the work of all three choreographers positively glows in the warm atmosphere of this unique studio, it is Bingham who inhabits the space most fully. That’s probably because he’s been exploring contact-improvisation here for close to 30 years. The studio has become an extension of his choreographic mind. Watching shows here I sometimes feel like I’m in the VIP lounge of the right hemisphere of Bingham’s brain. Sometimes I get to watch Bingham’s intuitive body, sometimes his intellectual body. Other times his body is all mood. Sometimes I watch his choreographic protégés stamping their own identities into the lineage of contact-improv. Tonight, in What is Left is Right, I witness an especially startling superimposition—the return of Chris Wright, a dancer who is part Bingham, part himself. After a long absence in the easternmost reaches of the province (the Kootenays, I think), Wright has returned to EDAM with explosive force. This is a performer who is acrobatically inventive, has the ability to make hairpin turns in an instant, and just keeps you guessing. There’s an internal life there too. The heart and brain are ticking inside every gesture. Bingham’s presence within Wright is strong, not only in aspects of the physical work—as in the ability to snake the spine in service to the cranium’s lead, the ability to adhere to a partner then become an oil-slick the next instant— but also in the even, self-possessed vocal delivery. Short exchanges of dialogue shot me back to past duets featuring Bingham himself. At other times Wright uses Bingham’s influence as a mere point of departure to launch himself into stratospheric explorations that are all his own. Wright is paired with Jacob Cino—Beat Boxer, DJ, rapper and dancer with EDAM since 1999. It’s been a while since I last saw him perform, and he has really stretched out, loosened up, and matured as a mover. He approaches each moment with a baseline of calm, overlayed with a playfulness that is open to whatever gets thrown his way. Exactly what you want from a contact dancer. Together the two men find humor, sympathy, and take genuine physical risks. You know they’re taking risks because sometimes they miss—and there’s nothing like a good crash to keep you riveted to the stage. The piece alternates between solos and duets, sometimes improvised, sometimes choreographed, and between isolated physical ‘monologues’ and leaping and tumbling ‘dialogues’. All of this is played out against a video projection of a lake-and-mountain-scape that fills the back wall from floor-to-ceiling and wall-to-wall. At one point Cino asks Wright, “Can you swim?” Wright answers first by making physical contact, then by saying, “We’re swimming now.” On some level they are mirrors to each other. Wright solos stage-right, Cino solos stage-left. They come together in the center. They trade sides. They are each other. They are themselves. Hence the title. But I also hear the echo of Bingham’s voice from previous works. There’s a layer here of Bingham musing to himself by the lake. What is Left is Right achieves an ideal balance between preset and improvised sections. The choreographed parts state the questions, and the improvised sections provide discussion. I’ve come to expect this level of sophisticated rhythmic interplay from Peter Bingham. After decades at it, he really has become a master of the form, open as that form may be. It’s a shame I know nothing about Indian classical dance. Its gesture codes contain a world of narrative meaning that, sadly, does not appear in my personal lexicon. That didn’t stop me from thoroughly enjoying Jai Govinda’s The Monk and the Courtesan. To be honest, I don’t need narrative in dance, so I was able to take joy in the movement for it’s own sake. Maybe that’s the point of it anyway. The narrator (Paromita Naidu) makes several references to a village courtesan (Jessica Jone), and from what I can gather a young man (Chengxin Wei) is interested in her as a symbol of his personal goddess of worship. The program notes offer this aphorism as a clue to the overall experience: “Form is only emptiness, emptiness is only form.” I can give myself over to that, and to the beautiful work of the dancers. I can also easily give in to the sublime pleasure of listening to live music performed by Kalpana Prasad (voice) and Neelamijt Dhillon (flute, sitar, tabla), with Jai Govinda himself offering some surprising vocal syncopations. The delicately layered sound mixes beautifully in the EDAM studio. As a result, the musicians and dancers are able to develop nuanced communication. In a perfect world, dance and theatre would never occur with pre-recorded sound. On the other hand, pre-recorded sound is only emptiness, and any form will do as a gateway to emptiness. Once again, if you’re looking for informed analysis you’ve come to the wrong writer. What do I know about modern ballet – contemporary dance crossovers? Not much. But if you don’t mind indulging an appreciative layman, then by all means read on. I lied earlier. These two pieces do not make a diptych. According to the program notes of choreographer Emily Molnar, Time Tell is an investigation of silence and “the internal timings of the body.” It plays off points of view “within a landscape.” The work consists of duets and group work featuring six powerful young dancers who give it their all and deliver the goods. And Molnar comes through on her promise: the point of view does shift, and the internal timings of the body are explored with precision stops, sudden shifts of rhythm, accelerations punctuated by self-inflicting slaps and kicks, and by sharp intakes of breath. The sheer physical exertion is matched by emotional intensity, underlined by musical selections than tend toward angst. It’s the jerky, twisty, staccato rhythms framed by recurring moments of physical arrest that made me link Time Tell to the second work by Molnar, Fragments of a Marked Space—that and the heavy ambience. There is clearly a commonality to the physical vocabulary and emotional tone Molnar explores in both works, albeit slightly different resonances are revealed through the diverse bodies of the dancers. Fragments was created with the two featured performers in mind: Jennifer Clarke and Chengxin Wei (his second appearance of the night) in mind. Among other things the piece is an exploration of “encounter” and “disappearance.” Being a female-male duet, it becomes yet another exploration of the difficulties of inter-gender communication—how we try to connect and fail. But there is a third partner here, an undefined element that is the result of the couple’s struggle, yet exists outside of it. At times we see Wei pointing to this thing, out there, beyond the push and pull of the physical duet. And Clarke, who infuses her performance with a palpable ache, often directs an almost longing gaze to that something-out-there that may be a key to mutual understanding, if only it could be plucked from the ether and fit to the purpose. Taking advantage of the maturity of these two dancers, Molnar is able to find deeper layers in Fragments using much of the same vocabulary she explored in Time Tell. It’s not so much a matter of superior physical technique, but of an emotional embodiment that comes with maturity. It was during moments of stillness that I found myself reaching into the depths of the performers. Both Clarke and Wei are able to go from full-forward thrust to pinpoint suspension. This crash of tempos seems designed to unfasten the spectators’ sense of security as they await impending intimacy, perhaps an intimacy of loss. The tightness of execution was particularly satisfying to see in Clarke whose body, in some past performances, often becomes the lash-end to the whip-handle of her shock of red hair. There have been shows where her hair has stolen my attention as it splashes across the canvass of the stage like the brush of an expressionist painter on speed. This time around I got to fully appreciate the physical talents this dancer possesses. The Molnar-Clarke combination provides exciting tensions. I’d be happy to see more from it. Together, Time Tell and Fragments take us on a journey of increasing intimacy. It isn’t happy travels—but it does draw on a deep pool of feeling. That goes for all of the evening’s performances. In one way or another, each choreographer offers something you can take home with you—another angle on being and emptiness, a meditation on self reflection, and an encounter with silence and longing.